Cue Heckle & Jeckle. 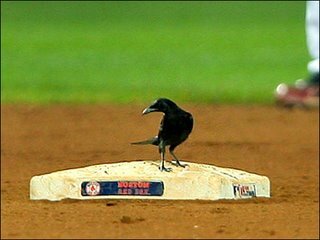 With a five-game Sox-Yanks series in the offing, Steve M cites the recent Fenway black bird as a portent of doom for the Townies. Perhaps what's been ailing the slumping Sox has been a collective case of avian flu. But is it possible Steve M and his Pinstripes will end up eating crow? Elsewhere in the Fenway zoo: Sock monkey.